Good. Light shelf wear to ends of spine, surface and edges of cover. Crease to bottom corner of back cover, otherwise a new unread book. Recommended for Ages 9-12 ONLY! This book was just okay. It?s definitely written for children ages 9-12. In my opinion, it?s not like the ?Harry Potter? series were it?s easily captivating and loved by readers of all ages. As a middle-aged adult it only barely kept my interest. A few of the characters were interesting, (Marcia Overstrand and Stanley also known as Rat 101), but there did seem to be too much set-up going on in just one book for the series. Angie Sage?s head had to be crowded of swarming ideas. I do not recommend this book and/or series to anyone over the age of 13. If it were not for Barnes & Noble offering it as one of its Free Friday?s ebooks, I would have never bought it. And I?m so very thankful that I didn?t pay any of my money for it. Book One is the mystery of the seventh son of the seventh son, who is prophesized to be the most powerful wizard they have ever seen in their time so far. This is mixed with the dark times of the necromancer and ex-ExtraOrdinary wizard DomDaniel taking over after the Queen?s murder. A little girl will come to learn of her destiny too. Filled from cover to cover with all kinds of humorous spells, mystical creatures, and magical objects, children who can?t get enough of ?Harry Potter? are going to love this series. I love Angie Sage's Septimus Heap series. I bought this book when it first came out and have read it several times since. It isn't only a book for children, as the title and description might imply, but the depth of imagination that Sage provides is amazing. I have to admit that I enjoy Magyk more than Harry Potter, it's true. 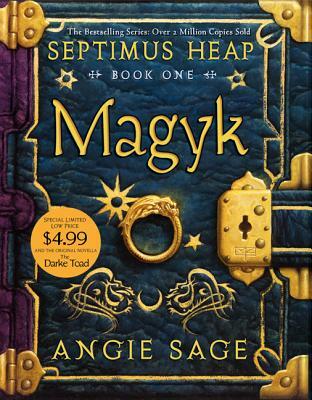 Angie Sage's Magyk is an excellent start to her Septimus Heap series. It is funny, fast-paced, and magykal.